We are in full swing preparing for the 2019 Berkshire Earth Expo, featuring the Cooler Community Challenge! What is the Expo about? 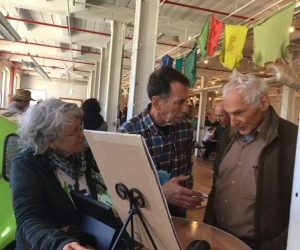 For the past three years, Living the Change Berkshires has been a key organizer of an annual climate and sustainability fair, the Berkshire Earth Expo, focused on energy efficiency, climate resilience, and environmental action. 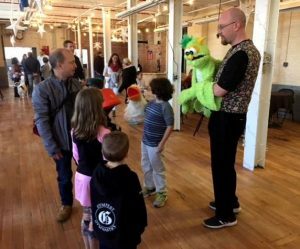 Presented in collaboration with community partners, the events feature climate-friendly vendors, exhibits, workshops, speakers, games and art-making for kids, poetry readings, an art show, music and more. Over 1,200 people have attended these fairs. For 2019, we are presenting the Cooler Community Challenge in conjunction with the 2019 Berkshire Earth Expo. What is the Cooler Community Challenge? The Cooler Community Challenge is an initiative of Living the Change Berkshires in collaboration with the Harold Grinspoon Charitable Foundation, Flying Cloud Institute, and other organizations and groups as well as Berkshire County Schools. To empower young people and celebrate their activities and contributions to solutions in energy efficiency, climate change, and environmental preservation and protection. Offer a new opportunity for teachers, students, parents, and community members to learn about climate, energy, and environmental topics, and provide hands-on activities that result in tangible outcomes community-wide. Lower our community’s energy use and energy-related expenses and our carbon footprint. Students are key to the Cooler Community Project! Study topics and actions can come out of many disciplines – from science and civics to art and hands-on work in the outdoors – and will be designed to comply with STEAM curriculum standards (see examples below). The presentations can take many forms, such as written documentation, posters, science projects, exhibits, drama, artwork, video reportage, and more. Prizes will be offered for participation! Each project participating in the Expo will be awarded a small grant. Student presentations at the Expo will be complemented by vendors and non-profits who will provide ways for visitors to take – or pledge to take – environmental, energy saving or other “climate-smart” actions. They will offer services and resources related to energy efficiency, greening our energy, transportation, food, and lifestyle. Please contact us if you are interested in a booth at the Expo. Experts, leaders, clubs, and groups in our community will be invited to participate in the Cooler Community Challenge and to provide guidance and resources for the project. It is our goal that actions and pledges taken and committed to by school and Expo participants will be tracked so schools and the larger community will be able to see the overall impact of the students’ work and the collective success of the event. We will provide guidance and tools to all participants so they can easily collect actions and pledges, and our team will follow up to compile the results. Leading up to, during, and after the event, an ongoing social media campaign will provide a platform for reporting on students’ development, execution, and follow-up activities, giving students a voice and presence in our shared journey to increasing sustainability, care for the environment, and climate resilience. We will provide schools with templates and links to help create a “buzz” around their projects. Promotion will include announcements about participating vendors and non-profits as well, increasing their visibility in the community. – A group of students joins Greenagers and report on what they have learned and done there. – A class conducts a survey of the energy efficiency of the school/home/neighborhood, writes a report and recommends improvements. – Students write letters to the editor/town, state or federal government official about an issue (pollution, climate change, endangered species, etc) that has been studied, or a change they want to see. – A class goes door to door to have people sign up for Energy Audits. – A school community/class and parents work together to address idling cars. – A school community pledges to use the school bus and sets up a carpooling system. – A class learns about different kinds of alternative energy. – A school/class starts a vegetable garden to complement school lunches. – A class learns about food waste and the biological processes of composting. – A class learns about different insulating materials and their applications. – A class goes to pull hardy kiwi with BEAT and learns and reports about invasive plant species. – A class researches and builds a pollinator-friendly flower garden at school/home/neighborhood. – A school finds alternatives for all single use plastic straws, utensils, plates and cups in the cafeteria. – A school changes from commercial chemical cleaning products to environmentally friendly ones. – A class creates posters about the Expo to attract visitors. – The school theater group writes a play related to climate change and performs it. Pledges to re-use, re-purpose, recycle, compost. We are available to meet with you to help you design your project! We will also provide a list of resources. Please contact us at: Livingthechangeberkshires@gmail.com or Uli at 413 329 3514.